Are you looking to find a reliable and affordable engine diagnostics company in your local area? If so, look no further than Exeter Auto Centre. 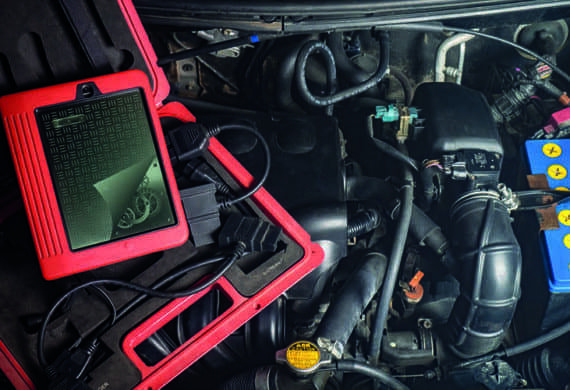 We proudly offer specialist vehicle diagnostics in Exeter and have access to the latest ECU diagnostics equipment. Our expert mechanics can offer customers a swift diagnosis of any issues in the vehicle’s engine. With over 18 years industry experience, we have all the knowledge and expertise to diagnose and repair your vehicle quickly and efficiently. In addition, to offering quality and reliable services, we also ensure that they all come at affordable and competitive prices. So, if you think your vehicle could benefit from our specialist engine diagnostics service, do not hesitate to get in touch. At our fully equipped service and repairs centre, we have all the necessary equipment to carry out specialist engine diagnostic services. Most modern vehicles are now built with a very small onboard computer. This computer continually monitors and feeds information regarding the general performance of the vehicle. If a problem with your vehicle is found, an engine management light will often appear on the dashboard. How Often Should My Vehicle have Diagnostic Checks? There is no legal requirement for how frequently your vehicle must undergo a diagnostics check. However, professionals will highly recommend that your vehicle has a diagnostics test at least once a year. Having regular testing can help prevent the likelihood of breaking down and also help identify minor issues that may not trigger the engine management light. So, if you think your car could be in need of a diagnostics test or feel something could be wrong with your vehicle, bring it along to Exeter Auto Centre today. Having an ECU diagnostics test with Exeter Auto Centre can bring many benefits to you and your vehicle. Previously, vehicles did not have smart ECU computers built into them which could result in high-cost repairs. By having regular diagnostic checks of your vehicle you can prevent these high-cost issues from occurring. The following list covers just a few additional benefits of our car diagnostics service. So, why wait? Get your engine diagnosis and rapid fix at Exeter Auto Centre. As your local experts offering vehicle diagnostics in Exeter, we can guarantee to customers that we offer all our services at affordable and competitive prices. For more information, give our experts a call today on 01392 464640. We look forward to hearing from you very soon!